Interest rates, loan amounts and monthly payments are all on the rise for car loans, and loan terms are increasing to potentially crippling lengths of 85 to 96 months. The Federal Reserve’s recent rate hike in September 2018 was the third increase in 2018. The quarter point increase made the cost of borrowing more expensive for everything from mortgages and auto loans to student loans and credit cards. What does all this mean for those of us trying to get an auto loan? Compounding the problem, nearly 80 percent of Americans are living paycheck to paycheck. To survive, consumers must find new ways to prepare for and manage car ownership. Here are a few best practices to help you get ready. 1. Do your car cost research before visiting the dealership. Find out what the MSRP is for the car you want and what inventory is available in your area. If you educate yourself before you start your search, you will know when you risk paying too much. If you are trading in a vehicle, research your car’s Kelley Blue Book® value, so you’ll know what to expect for your trade. If you owe money on your current car, find out how much by requesting a payoff amount from your lender. Compare what you still owe to your potential trade-in value. Use this information to help determine when the optimal time to trade-in is, and how much you should save to use as a down payment. Check your credit score six to nine months before financing a vehicle to know what to expect your interest rate will be. A smaller interest rate means less money owed on top of what you finance! Financing the lowest amount possible is usually the best way to save money. If your score needs work, try these steps to improve your credit score first or consider saving for a larger down payment. 3. Get the newest car, with the fewest miles, at the lowest price. By considering all three of these criteria at once, it is fair to say you can find the optimal middle ground. Usually, the newer the car, the more it costs. The lower the price, you’re sacrificing age, options, or adding mileage. Ask yourself each of these questions when considering your new car to find the one that is perfect for you. By now, it is common knowledge that making biweekly payments on your auto loan can help you pay off or reach your best time to trade faster. But, with the standard amortization on your loan (your payments go toward more interest than principal at the beginning of your loan) how do you know that your extra payments are being applied to the principal? Can you really remember to make an additional payment every month with everything else that you have going on? AutoPayPlus takes all of the work out of the process and helps their customers to do just that. Be realistic about your overall financial situation. Purchasing a car is a big investment, and there are many costs to consider. On top of the purchase price, account for tax and title costs, as well as any add-ons such as GAP insurance, or a service package to cover maintenance on your vehicle for the first few years. Requesting an insurance premium quote for the vehicle you’ve got your eye on before purchase is also a smart step. Perhaps it’s best for you to continue paying down your current loan for a time, giving you a chance to save for a down payment or reach your optimal time to trade. Or, maybe now is the time to move to a more affordable vehicle. The perfect solution is unique to you. But, you are not alone! We are here to help you make the best decision. Use our auto loan calculator to get a better idea of how our service can benefit you. 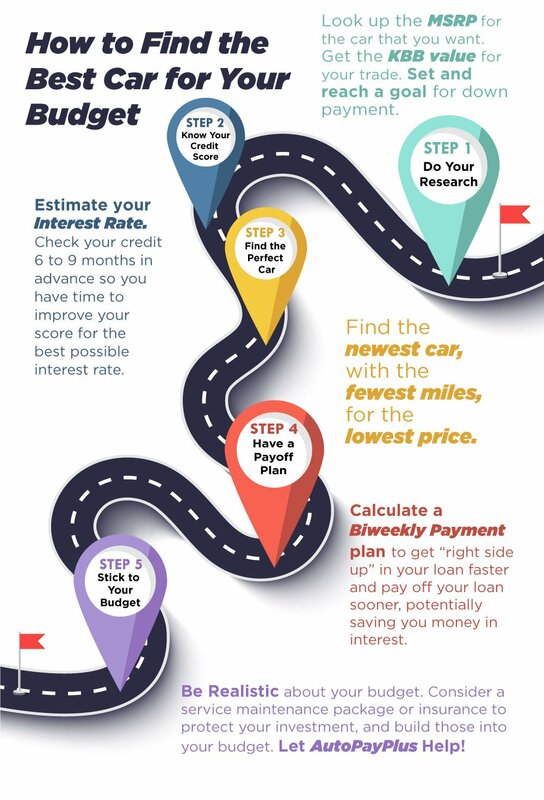 Following these steps can arm you with the information and confidence to make the best decision for your financial situation, and find the perfect new car, in these changing economic times.